When Godus was released in Early Access last year, it was not good. We took another look in March, after 22cans had implemented an update they claimed would hugely improve the game. And lo, it was still not good. 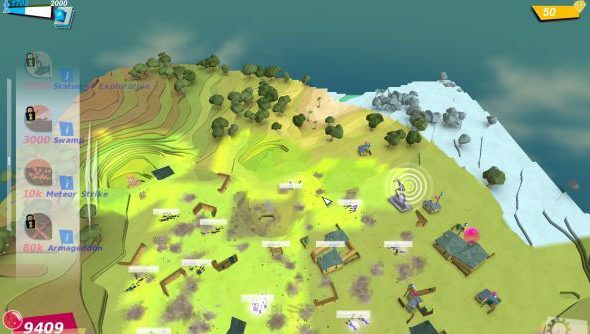 Now it’s August, and Peter Molyneux believes the studio couldn’t have done more to fulfil Godus’ initial promise. Molyneux said that Godus faced a “community crisis” – and acknowledged that Early Access had been hard for 22cans. He believes lots of players have already dismissed Godus based on a 25% finished version of the game. “This has been the hardest thing I’ve ever done in my life, because a lot of people have judged the entirety of my career and the whole future of something like Godus based upon [that early version],” he told Pocket Gamer. But Molyneux says he takes the criticism, which has lasted “over a year”, for the sake of making a great game. “I’d take it every single time,” he said. “I’d take the bullying, every single time, because I completely believe that there is a brilliant game there in Godus that is going to bring people together. 22cans have spent the last few months focusing on the game’s mobile version – but are now turning their attention back to PC. Have any of you lot tried Godus again lately? How has it improved?